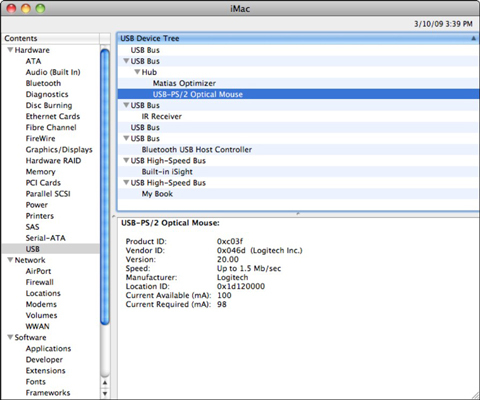 If you need information about your hardware or to find out precisely what hardware is installed in your Mac, Apple provides Mac OS X Snow Leopard with an all-in-one hardware and software display tool, aptly named System Profiler, which you can find in the Utilities folder within your Applications folder. You can also reach the Profiler through the Apple menu. Just click About This Mac and then click the More Info button. As with the folders in a Finder window in List View mode, you can expand or collapse each major heading that appears in a Profiler screen. Just click the triangle that appears to the left of each Contents heading to expand or collapse that heading. Display information about your Mac’s ports and connections. Software: Okay, this heading shows something useful to the average human being! This screen lists all the applications, fonts, and preferences recognized on your start-up volume, along with their version numbers. If you’re wondering whether you need to update an application with a patch file (to fix bugs in the software) or update a file from the developer, you can look here to check the current version number for the application. You also get a rather boring list of the extensions (or drivers) used by Mac OS X applications. Logs are usually valuable only to tech support personnel; they document recent lockups, application crashes, and even system crashes.